One of the big questions people ask when designing a living room is how high to mount a TV. Normally you have some options for where to put a TV in the living room. Before you pick up that heavy TV, let’s take a look at how to determine the best TV viewing distance and how high to mount a TV. Should I Mount My TV or Put It on a Stand? Gone are the days when a giant television came in its own furniture cabinet, or when the entertainment center dominated the room because the TV was the size of a stove. Good riddance! Thanks to flat screens, you can usually find space on a wall that is strong enough for TV wall mounting. Setting it on a credenza or console is an option that still ensures both storage space and flexibility, and provides an elegant solution for hiding all those cords and wires. 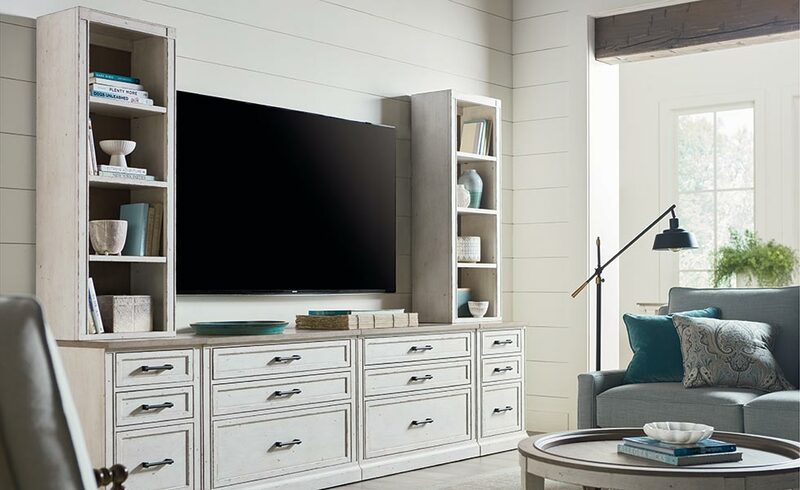 Modern credenzas have baskets, drawers, and shelving to help camouflage components like your Firestick or BluRay player, plus games, movies, and remotes. Even if you decide that TV wall mounting is the way to go, you can still use a console underneath for a finished look. How Big Should My TV Be? What Is the Best TV Viewing Distance? How big your TV should be and how far it should be from the sofa are really two sides of the same coin. In general, the trend these days is to err on the side of a larger TV. Especially with high definition technology, people seldom notice that the TV is too large, but definitely notice if the scale is too small. If it’s easier, just remember a general rule of thumb: the recommended distance for viewing is 2.5 times the diagonal length of the TV. With high definition TVs, 1.5 times the length of the TV might be more appropriate. In your living room arrangement, how far will your sofa sit from the screen? That measurement should tell you what size TV would work best. TV Wall Mounting – Where Is the Sweet Spot? Whether you decide to set the TV on a console or mount it on the wall, the best height for a TV is actually the same – eye level for a person sitting on the sofa. In general, that means the center of the TV should be about 42” above the floor, regardless of the size of the TV. How high to put a TV on the wall is a little different if you are mounting it, say, behind a bar where most people will be viewing it from bar height stools, or in a kitchen where people will be standing while watching it. The goal is that the viewer can relax without worrying about neck strain. When deciding where to put a TV in the living room, the logical place is across from a sofa. You can use swivel chairs on each side of the sofa if you would like to allow two arrangements – one for conversation, and another where everyone wants to see the TV. The TV is a focal point as much as the fireplace or the picture window is. Having two focal points can work just fine, because usually only one focal point is drawing most of the attention at any given time – the crackling fireplace, the beautiful outdoor view, or the big game on the TV. If you can, avoid putting the television over the fireplace, since it will usually be too high on the wall. Depending on the room, you may be able to place it on a credenza kitty corner from the fireplace. 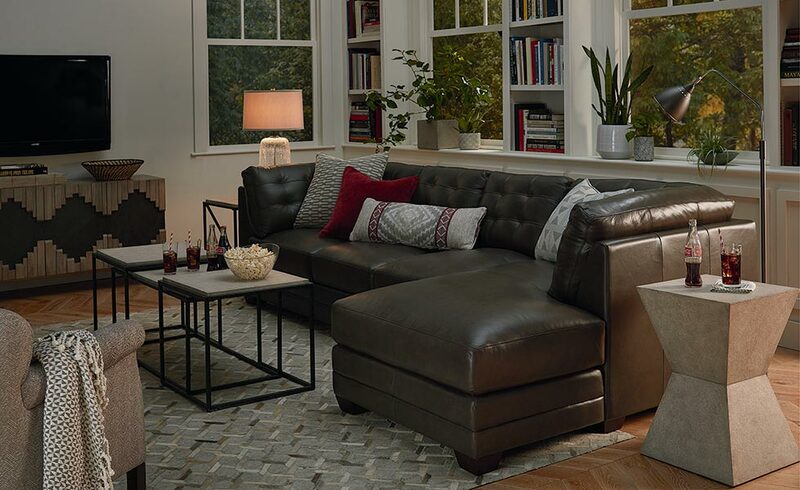 Wherever your decision about how high to mount a TV takes you, request a Bassett Furniture catalog for beautiful design ideas for your living space.